Well friends, it’s that time again! 10×10 Challenge time that is! 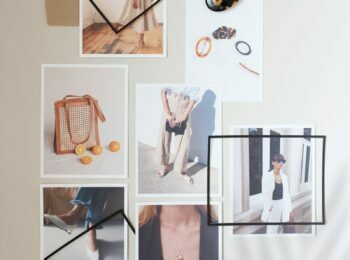 My best blogger pal Caroline of UnFancy and I are thrilled to be teaming up for another instalment of this fast, fun and furious little style series. In case you’re new or need a recap, the 10×10 Challenge is a super simple exercise that anyone can do. 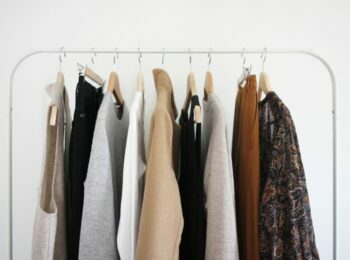 You just need to choose 10 items from your closet, create 10 looks with those items, over 10 days. Easy peasy right? Right! 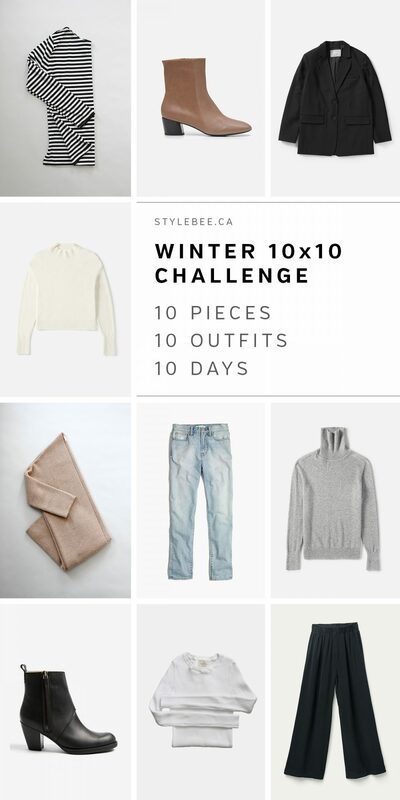 The 10×10 Challenge is something I first tried out during a shopping fast in 2015 in an effort to get more creative with my closet. 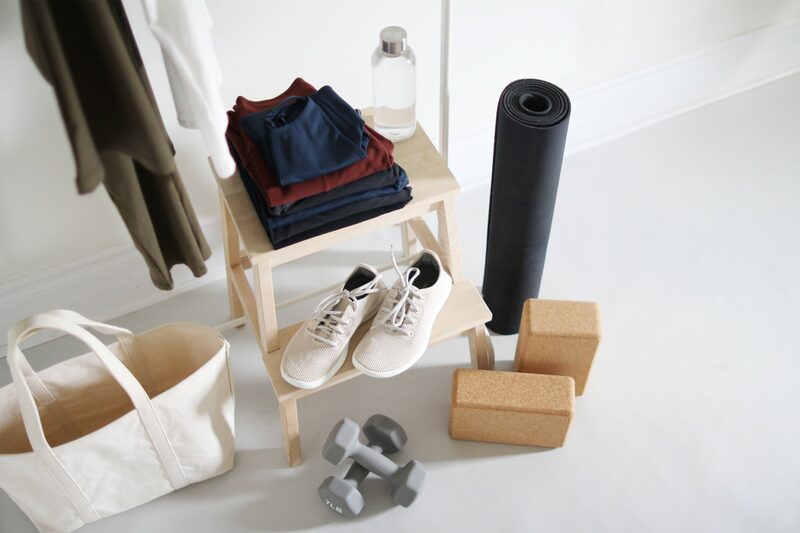 From there, with the help of Caroline and so many other style savvy, conscious closet folks, this challenge and the incredible community around it has really taken off. Now people all over the world are joining in and seeing how fun and useful it can be. It’s awesome! Another reason why I think this exercise has been so well received is because it’s all about what you learn as you go and take away from it, not so much about how great your looks turn out or how closely you stick to the guidelines. It’s also a wonderful way to connect with other folks who are exploring their style too. In fact, the #10x10friends community is probably my favourite part! 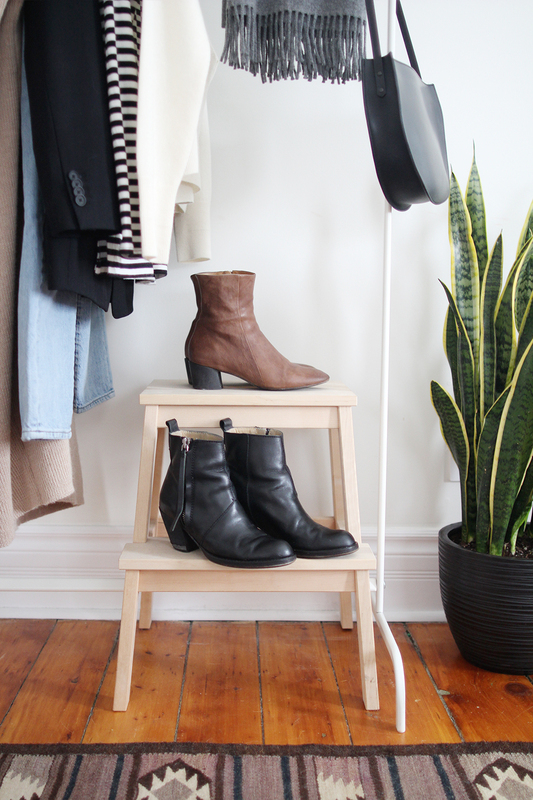 It’s welcoming, supportive, easy-going and full of great insights and style inspiration. So what do you say, care to join the fun? I sure hope so! Still not sure, no worries, this post has all the info you need! Embrace the need for comfy-chic. This will be my tenth 10×10 Challenge if you can believe it! That being the case, one might assume that there’s little left to learn from such an exercise. But here’s the thing, every time I do it, it’s a little different and I discover something new. So even if it’s mostly just a refresher, I find it worthwhile. Plus it’s a new season of my life (literally and figuratively) so it’s a great way to check in with myself and recalibrate my style a bit. I’m not sure if it’s this time of year or because it’s been so insanely cold but I’ve been really craving all the creature comforts these days. Hearty meals at home, hot tea, red wine, extra blankets, bubble baths and cuddles with my fur kiddos are all top priorities. 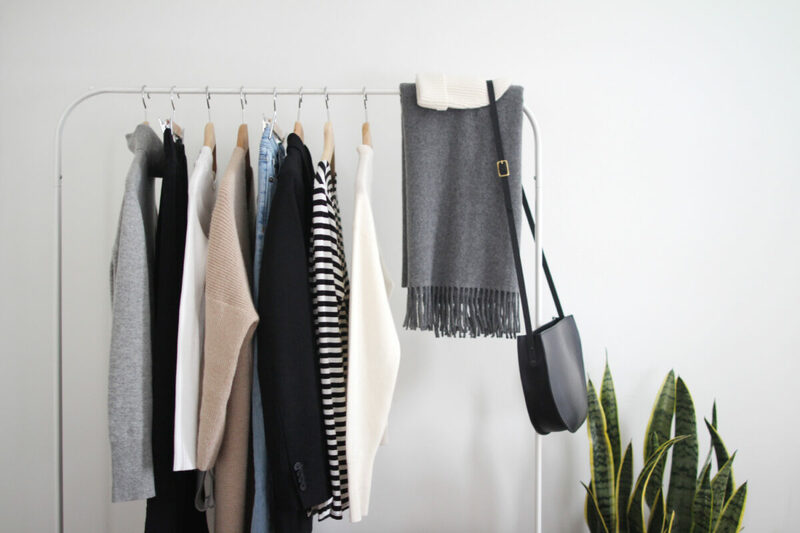 Basically I’ve been devouring all things hygge lately and those cravings have extended to my closet too. I’ve found myself reaching for pieces to keep me cozy while still letting me feel as though I’m properly put together (and getting me out of my workout gear). I’ve also been keeping things super simple when it comes to colours and shapes and choosing soft, warm fabrics to wear against my skin. 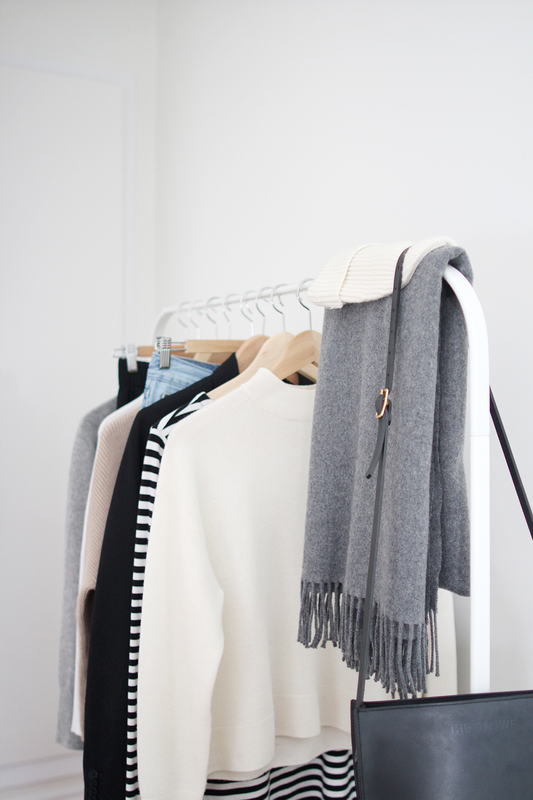 Cue all the toasty cashmere and alpaca knits and pair those with soft cotton and slinky silk. Oh hello! So I suppose more than aiming for a specific goal I’ve decided that I’m going to take it easy on the style front this time and just go for simple looks that I feel good in while enjoying some of the winter closet items I really like wearing these days. The outfits might not be anything groundbreaking but that’s ok! Last time I did the 10×10 challenge in 10 consecutive days instead of taking weekends off and doing week days only. I really enjoyed the momentum that came with this straight through approach and was pleasantly surprised by how quickly it flew by. So, I’ll be doing that again this time! In fact, I’m starting with my first look today and I’ll be sharing it on my stories this afternoon. In terms of blogging, my plan is to share my first 5 looks in detail on the blog next week and the final five when I wrap up on the 29th. I’ll be sharing each look daily in my stories though! Here’s to 10 days straight my #10x10friends! WEATHER: It’s been crazy cold over the last month here in Ontario but the temps are calming down slightly to hover around 0°C which is much more bearable than the -25°C we’ve been desperately avoiding. ACTIVITIES: The next ten days are going to be a mix of meetings, working from home, dinners out with Dave and family, a birthday party and daily workouts along with the usual errands and business out and about. It’s going to be pretty busy but nothing too intense. So here’s what I’ll be rocking for the next 10 days! Same as last winter I decided to leave coats off my list of 10 pieces and just focus on inside looks. Plus it’s been so cold that I usually need at least two layers on indoors! I’ll be sure to share an inside and outside version for this round too though which is always a fun style exercise. So with that detail noted, here are the 10 items I’ll be wearing for this 10×10 Challenge! Even though this striped tee was one of my most worn pieces in 2017 and I didn’t really need to wear it more, the thought of going 10 days without it was too much to handle. So here we are! It’s also super easy to wash and dries fast so it’ll be quick to freshen up after each use. 2 – CALLY BOOT* | c/o COCLICO | $435 USD | Made responsibly in Spain | I’m a US 7 and have the 37.5 which fit snug at first but relaxed with wear. | *Save $20 at Garmentory when you sign up here. These are easily one of the comfiest pairs of boots I’ve ever owned. The leather is so supple and the heel is the perfect height for all day wear. 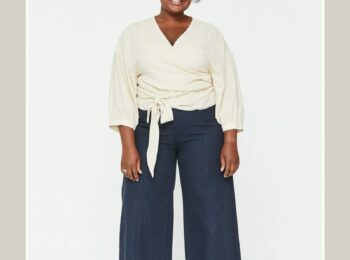 I LOVE the tall shaft with all my cropped pants and really helps keep the cold breezes at bay. I’ve logged some serious step counts in these beauties and cannot recommend them highly enough! Also, they clean up really well so I don’t worry if they get wet or salty. 3 – BOYFRIEND BLAZER – Everlane – $150 USD – Size 2 – Made responsibly in China. I’ve said it before and I’ll say it again, my blazer addiction is real and I couldn’t resist this perfect black option from the Everlane release last Fall. It’s a timeless piece and so easy to throw on over jeans and sweater with a leather boot to instantly feel like a boss babe! I have a very good feeling that this one will be in rotation for many years to come. The cropped cashmere sweater from Everlane is one of my favourite winter styles. It’s just the right amount of cropped without being too short and looks great worn loose or front tucked. The mock-neck is a nice design solution to keep your neck warm without adding too much bulk. 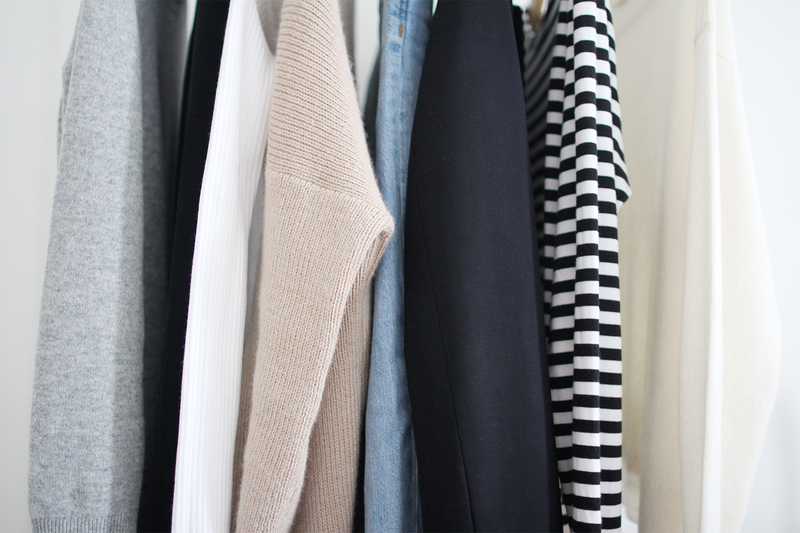 I’m also really loving light tones in my winter closet these days. 5 – LONG CARDIGAN* | Han Starnes via Garmentory | Sold Out | Made responsibly in Peru. | *Save $20 at Garmentory when you sign up here. This cardigan is likely one of the best additions I’ve ever made to my winter wardrobe. It’s been my go-to whenever I want to be toasty cozy in a flash but still look chic. It’s held it’s shape remarkably well, even after long days spent sitting at my desk or evenings curled up on the couch. No pilling to speak of yet either! I’m sorry it’s another sold out item but I think there might be one left in Stone, a dark brown here. Hopefully Han Starnes brings something similar back next year! I’m kind of surprised that I’ve never included these jeans in a 10×10 Challenge before. They’re from my fast fashion shopping days but they’re still one of my favourite pairs of denim. I’d always kept them in the warm weather section but recently felt the urge to pull them on so, we’ll see how they work for winter! I bought this sweater last Fall to replace an old one I’d had for ages but was too small so I never wore it. This one has a great relaxed fit but still tucks nicely into a high waist pant or layers under a cardigan or blazer. It’s a true classic. These might be the oldest investment footwear I have in my closet and they’re still going strong after several winters! I’m thinking I’ll need to take them for some heel repair after this challenge but the leather is still in amazing shape and they feel better than ever. I know bodysuits are a somewhat polarizing item. People either seem to love them (that’s me!) or think they’re weird. Being of the former mindset, I am 100% in love with the ones I got last Fall and I’ve been wearing them literally every week since. Definitely keeping an eye on this brand too! Now silk pants aren’t exactly known for their insulating capabilities but my WORD are these pants ever comfortable. As you know, I’m a Florence Pant fan for life and I’ve got to say, these might be my favourite ones ever (I still haven’t tried the canvas though). 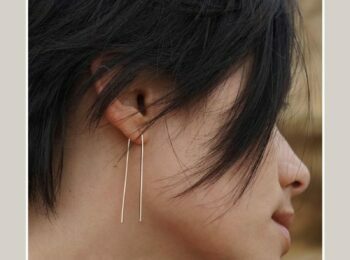 I wore these to literally every party or event over the holidays and they were the perfect mix of luxe and low-key. Safe to say, I’m obsessed with these pants. 2 | Use the hashtag #WINTER10x10 so we can see what you put together! We’ll be sharing our favourites from the feed during our wrap-up posts too! 3 | Feel free to include the existing hashtags #StyleBee10x10 and #UnfancyRemix if you like as well! That way they’ll be in the general archive for all future challenges too. Don’t give yourself too much time to choose. Try to make the call in under 30 mins. But if you need more, that’s cool too! You’ve got all weekend to play around with your picks if you need until Monday. FEEL FREE TO DROP ANY QUESTIONS YOU’VE AND I’LL DO MY BEST TO ANSWER THEM TODAY. I’LL SEE YOU TOMORROW ON INSTAGRAM STORIES WITH LOOK #1! 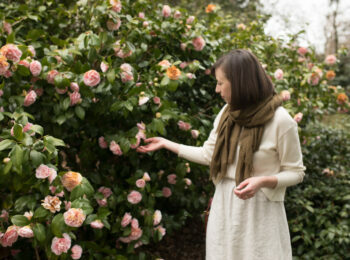 DON’T FORGET TO SEE WHAT MY PAL CAROLINE PICKED FOR HER 10 ITEMS TOO! I’d love to see a 10×10 challenge where the influencers/participants incorporate more affordable items into their rotations. I love seeing everyone’s outfits and get a ton of inspiration (both fashion & ethical) from what you all post, but I honestly can’t afford all of these items in the $150-300 range that everyone’s featuring (nor am I an influencer receiving c/o’s), and I’m sure I’m not the only one. It would be really cool to see a 10×10 with, say, a $100 cap per item. I do understand how and why ethical fashion costs more, but I’m sure there’s a middle ground between a $250 sweater and a $20 piece fast fashion piece from Target. It would be an interesting challenge to see you all work with thrift store finds and sale section purchases! Thanks for hosting, Lee…excited to give this a shot!! Why isn’t your cohost participating? For the second time in a row? I enjoy comparing and contrasting the two styles but without Caroline the exercise is lacking. Hi Lilah, Caroline is participating but only on her Instagram account @caroline_joy (not on her blog). There are hundreds of other women participating on the #10x10Friends and #Winter10x10 feeds as well. 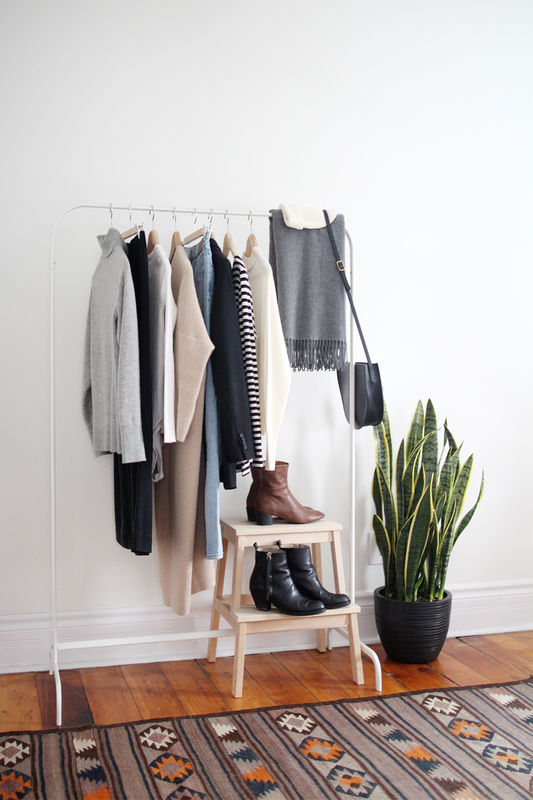 Tons of outfits and inspiration to scroll through and enjoy too! Looking forward to Look #1 on Instagram today. Ah this makes more sense, up until now it said on this blog that on the 19th of january the spring challenge would start. This will be my first challenge 🙂 I picked my items yesterday, but I already realize something that is missing so I might still switch it out. Oh and I also just read your post about loungewear, and I was wondering how many seperate wardrobes sections do you have next to the current (10×10) one? You mentioned camping, lounge and sleepwear? I have my day-to-day (which encompasses my 10×10 items), loungewear, workout, formal and pjs, which is basically just stolen boxers and t-shirts from my husband haha. I used to keep some camping gear tucked away but I’ve since amalgamated that into my loungewear and workout stuff and just pull from those when we pack. Would love to know where that grey scarf is from! Hi! Love the idea of this challenge and have followed but not participated for some time. Wondering if you have tips for participating in the 10×10 when you work in a corporate/business casual setting? I have some pieces (sweaters /jackets mostly) that transition between work and everyday, but with an infant at home on the weekends and the need for polish during the day I’m having a hard time figuring out how to make just 10 pieces work! Hey Em! Great question. I would just focus your 10×10 items on either work OR after work. Sounds like office might be the best place to start since your pieces might stay fresh longer and then you can have full range of your loungewear when you’re home with the babe. I still have full access to my workout gear and comfy stuff during the 10×10 Challenge, otherwise it’s too restrictive for real life. Hope that helps! I never participate in these, but I always pick items for them as if I were. 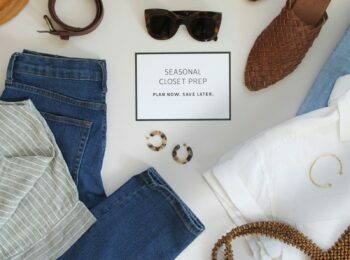 🙂 My picks this time are: ivory/black striped long-sleeve tee, grey cotton crewneck sweater, ivory rayon raglan sleeve sweater, white ribbed V-neck sweater, black cords, light rinse jeans, black linen blazer, taupe wool sweater jack, black leather ankle boots and black suede chukka boots. That’s great! Thanks for sharing your picks Carol. I find that part of the process can be so helpful. 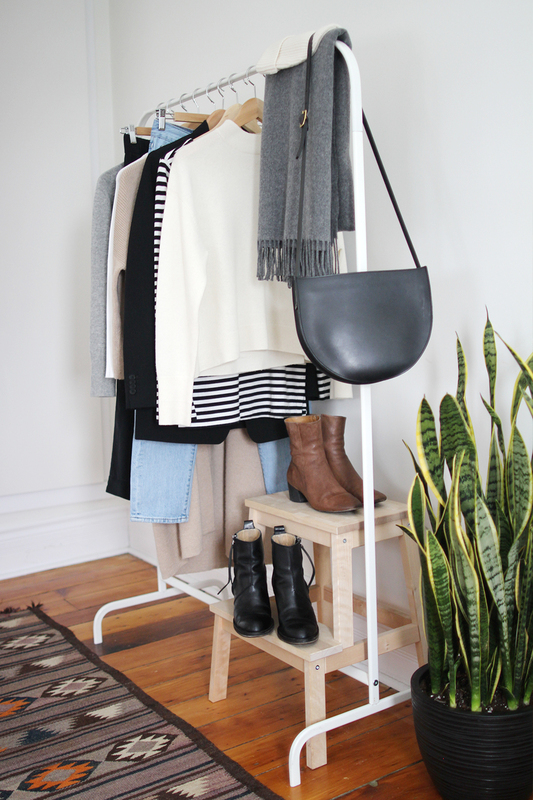 Just identifying what items you want to wear and thinking about ways to mix and match is a great exercise! You know I’m always in for the 10×10 and this round is no exception! Thanks, as always, for hostessing another round. When I was choosing items I think I was ‘searching’ a little too hard for a goal for this round, so instead I went with what I was drawn to and we will just see what I get out of it. But, I have no doubt I will have some takeaways, because I always do. I just bought those same Madewell jeans on poshmark in November and included them in my 10×10, so I look forward to seeing how you style them! Thanks Leigh! Great name btw 😛 They run a bit big but I find they’re great for colder temps because I can wear a thicker sock. I am a US 7 and have the 37. Hope that helps! 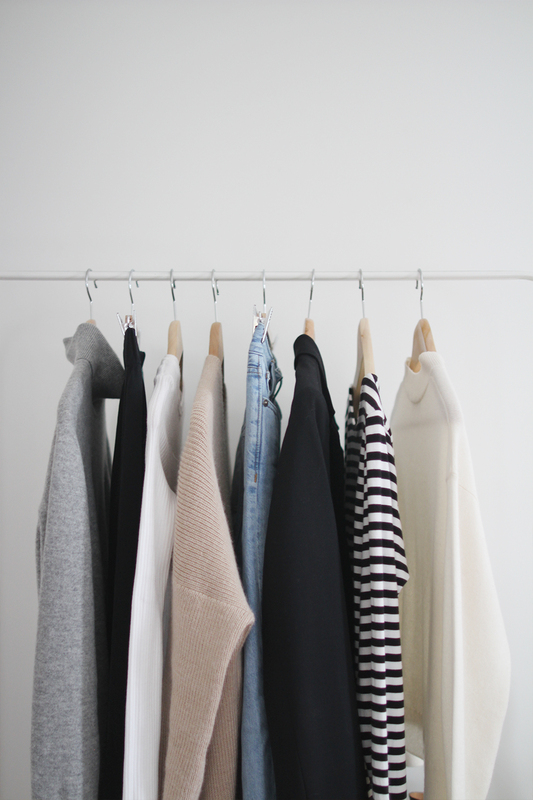 I also love Everlane’s crop mockneck and included it in my ten items (in black). White makes me so nervous, but you’re really tempting me to buy another! I’m going to give this a try. Have been so unmotivated getting dressed in Canadian winter as I spend most of the day covered in a huge coat, scarf and ugly snow boots. So it hasn’t really mattered what I wore underneath! But looks like it’ll be above 0 for the next week in Toronto so I think I can finally wear something other than ugly snow boots!!! The last report I can access for Unfancy is 10/17. Where is her winter 10X10?